I recently revealed that I’m running for office, so it’s no surprise that a book about two young hopefuls moving to Washington, D.C. to pursue a career in politics would intrigue me. Plus, The Hopefuls is by Jennifer Close, whose book, The Smart One, was one I thoroughly enjoyed. Unsurprisingly, I quite enjoyed this one, as well. The Hopefuls follows Beth and Matt, two millennials who move to D.C. from New York after Matt’s success on the 2008 Obama campaign. Filled with hope (and yes, looking for change), they pack up their lives. But moving, particularly when it’s for one person’s career, can get sticky, which was the case for Beth. Although she was raised in Wisconsin, she had a tough time leaving her beloved city for the hustle and bustle of politics. But the difficulty she had adjusting took a turn for the better when they met Jimmy and Ashleigh, another married couple of up-and-comers. They quickly became inseparable, but as do most fearsome foursomes, underlying tensions began to bubble up. Many of the reviews I’ve read mentioned that the characters in The Hopefuls were unlikeable. I can see how this could be true but as someone who has spent a good bit of time with people in politics, I’d argue that they simply have a peculiar approach to life that doesn’t resonate with everyone. D.C. is its own breed of people and while this lifestyle is sometimes portrayed as harsh or filled with false niceties, it’s not unrealistic. That said, I didn’t find any of the characters particularly likable, but I did understand where they were coming from, so even when they drove me mad, I wasn’t entirely surprised. My only major complaint is that Beth, the narrator, is the only character who is fully developed. Matt plays a central role, yet we don’t get a glimpse into why he does what he does or feels the way he feels. It was a bit frustrating because he’s such a key character in story. We only get Beth’s side of the story, which would have worked out well had the writing given me reason to believe it was intentional, but I wasn’t under that impression at all. Close can get away with leaving Jimmy and Ashleigh a bit more ambiguous because they are secondary, but with the missing Matt portions, it only highlighted the development that was already missing. Despite these shortfalls, I was overcome with trepidation about my own race’s impact on my marriage. Like Matt, my husband works a lot and maintains his calm. And like Beth, I laugh at inappropriate times and know how to navigate politics. In my life, the roles are reversed – I’m the one with the political ambitions while my husband is the one supporting me, but there were times when I wondered if Beth’s thoughts about Matt’s career ever crossed my own husband’s mind (he says no and, as the book went on, I became less concerned about my own marriage, but let’s be honest – books oftentimes infiltrate our personal lives). Perhaps it was this own recognition and wonderment that made the characters less unlikeable in my mind, but maybe it’s just because I don’t mind unlikeable characters. 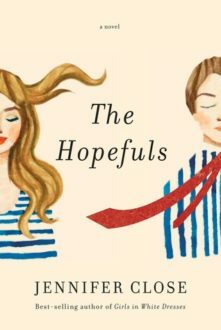 If you’re looking for a book that dances around D.C. life and politics but don’t want anything too heavy or dramatic, then The Hopefuls is a good place to start. Recommended for: Readers looking for a light read about the toll a move and career change can have on a marriage.